Looking for an adrenaline rush? You don’t need to go far for an extreme activity. These kind of activities can give you a stronger heart and body. People usually do this to exercise their muscles and to just relax and go far from the concrete jungle they see every day. If adventure and thrill is what you are looking for, Samar’s accelerating torpedo ride in Ulot river is for you. Ulot river is Samar’s longest river. The word TORPEDO stands for Tour Guides and Boat Operators for River Protection and Environmental Development Organization. This activity is just like water rafting but without the need of paddling because the boats are equipped with engines for navigation. Before doing the tour, you will have a very short briefing at the drop-off point. 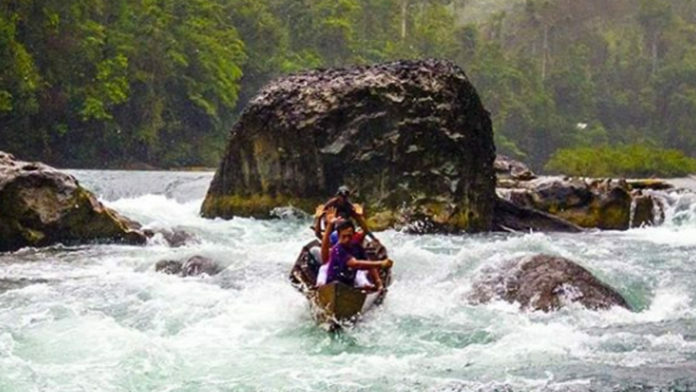 The boat driver will inform you that it will take roughly 40 minutes to reach Deni’s Point where you can experience jumping in the raging river just like jumping in a washing machine. You will surely get wet because of the splash from the boat. You will definitely be 100% wet the moment you arrive at Deni Point. Don’t worry about your gadgets and things because they have plastics to cover them up so that they won’t be wet when you reach Deni point. Aside from seeing the natural beauty of nature, bird watching is also one of the things that you can enjoy while you are at the extreme boat ride. You will really see different species of birds flying together. This is a sign that these forest and rivers are untouched and are well maintained by the locals. After arriving at Deni point, you will be welcomed with piles of beautiful rocks and a beautiful raging river. The locals will soon guide you where you can experience the river cliff diving. This experience can really satisfy and meet your travel goals. Ulot river is the longest river in Samar spanning 90 km. Jump off point for the Ulot River Torpedo Extreme Boat Adventure is at Samar Island Natural Park headquarters at Sitio Camp Uno, Brgy. Tenani, Paranas. The word “ulot’ actaully means Monkey in Waray dialect. Other activities you can do while you’re at Deni point are eating and swimming. It’s really an exciting adventure that you need to try at least once!